One day in the fall of 2017, twelve-year-old Anna was picked up a few hours early from school in her hometown of Silverdale, Washington. With her father, Augustine, she went to the local oncology clinic to surprise her mother, Angela, who was finishing her very last treatment for cancer. It had been a tough year for their family. Angela had been diagnosed in late 2016 and spent the following months undergoing multiple surgeries and chemotherapy. Near the end of Angela’s cancer fight, her own mother – Anna’s grandmother – passed away unexpectedly. After that last appointment, though, it felt like the hardest part was behind them, and the family tried to get back to a normal routine. But their return to normalcy lasted only a few months: in March, Anna found a lump on her collarbone. “Because of my mom’s diagnosis, I knew that I should report something like that,” says Anna. “So I went to my mom and said, this doesn’t seem normal and it’s bothering me.” They saw a doctor a few days later and, after some tests, the diagnosis was confirmed: Anna had Hodgkin’s Lymphoma. 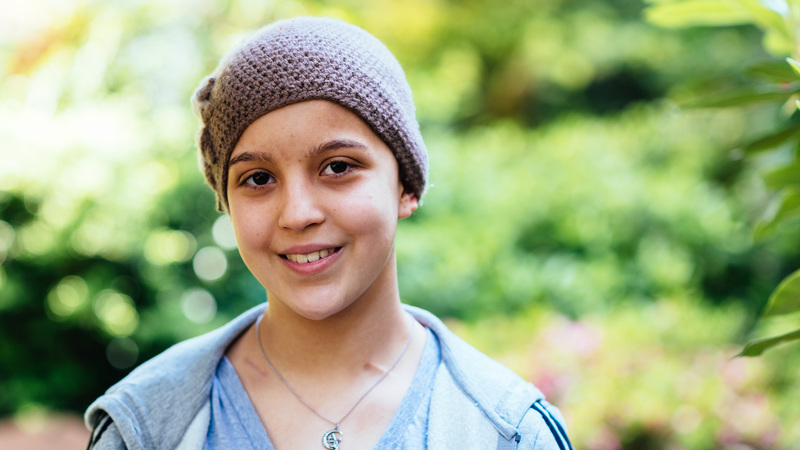 The day that Anna started chemotherapy, they got a call from the Ronald McDonald House in Seattle: a room had opened up. They were able to sleep there that night. Anna knew that chemotherapy would be hard, and it was. But what she found most difficult about living in the Seattle House was being away from her friends and family. Back home, she was on the wrestling team, played clarinet in the school band, and spent her weekends with her friends, family, and dogs. She’s been able to get out of the Seattle House during her treatment, to explore the local parks, go to the zoo, and even attend a concert. But it was still tough to suddenly be cut off from her community. Luckily, the Ronald McDonald House offered her a place to connect with her family and friends – to bring that community to her. Anna has also found comfort from the therapy dogs that visit the Seattle House. There are different dogs visiting the House almost every day, but her favorites are Weslyn (a yellow lab) and Adele (a poodle). The therapy dogs make it a little easier to be away from Anna’s own dogs, who are being cared for by her brother while the family is separated. Our donors and volunteers help us provide housing, a welcoming community, and essential services to families like Anna’s. To get involved, check out our Donate and Volunteer pages today.